Most of the regiments used the provincial coat of arms as the emblem in their colours. In most cases each regiment had the same number of colours as it had batallions or squadrons. Jaegers had no colours. The pdf file below has a number of ready-to-print flags. The model 1766 2b has slightly thicker and almost leaf-like decorations than the previous 2a model. Guard and household regiments all have very similar colour designs using the king’s monogram on both sides with the exception of Queen’s and Queen Dowager’s life regiments that used the royal ladies own monograms on one side and either king’s monogram (queen’s) and the royal crown (queen dowager’s) on the other side. All guard and household flags were white with gold monograms. The cavalry guidons had the king’s monogram on one side and the provincial coat of arms on the other side. 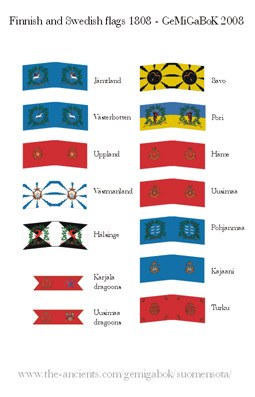 As no info was found for usimaa dragoons’ guidon we assume that presumably they used the old guidons of Uudenmaan ja Hämeen rakuunarykmentti ie. coat of arms of Uusimaa. infantry 210 x 180-190 cm, cavalry 60 x 60 cm and dragoons 120 x 100. Livgardet till häst had no guidons. The flags found herein have been made to fill the whole standard of Minifigs or Old Glory standard bearer. Thus they are proportionately larger than real flags. This was necessary due to the fact that the provincial coat of arms in the flags are quite small and making the flags real sized would render these almost incomprehensible. The flags were first drawn by hand 10 times larger than needed. After which they were scanned and scaled to the wanted size and colorized. Then a mirror image for each was created. Finally the flag was put to a slight angle to depict the weight of the cloth sagging the flag down. Print the sheet. Cut the needed flag out. Dry fit the flag to a straight piece of metal (a suitably thick needle for example) and try press the inner edge of the flag against the needle with your fingernail as to get the flag to the shape it should be when attached to the standard (ie. the middle part should be circular). Using a paper glue of your preference glue the flag to the standard and the insides of the flag to one another preferably starting from the outer edge. Note that most glues tend to cure almost immediately so you have to be very careful when gluing as the repositioning will be almost impossible. When you are satisfied with the flag squeezing it by the pole with a pair of tweezers ensures a tighter fit. After the flag is firmly in place take a rod that is slightly thinner than a small brush and roll the flag into it until you are happy with how it flutters. This might cause some colors to slightly come off so prepare to do some touch- upping. In any case you’ll need to paint the edges of the flag instead of leaving them white. Höglund, Lars-Eric & Sallnäs, Åke: The Great Northern War 1700 – 1721. Acedia Press, Karlstad 2000.